A 31-year-old lawsuit filed on behalf of students in the state’s poorest school districts just came roaring back to the Texas Supreme Court. At issue is how the state funds education. Lawyers for the poor districts, including Edgewood ISD, challenged the state’s funding formula, which lets rich school districts outspend poor districts by $1,100 per student, or $27,450 per classroom, or $823,500 per school for things like on teachers, curriculum, books, technology tools and supplies. Property poor school districts levy taxes at a higher rate, receive less funding, and have higher needs. The disparities yawned wide after Texas cut education funding by $5.4 billion in 2011. Though some funding was restored in 2013 and 2015, the number of students who need the most help has grown, particularly those who come from poverty and students who are English language learners. You can replay the Supreme Court hearing and find a curated selection of resources to learn more about the case at this link. 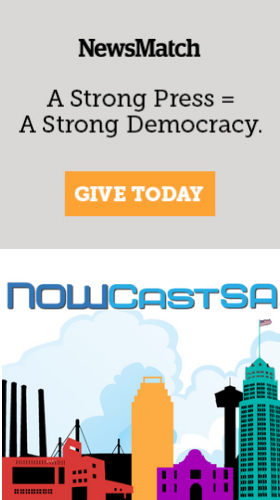 Only on NOWCastSA can you find stories from parents and teachers about the real-life impact of the funding cuts. At a recent forum, Jorge Montiel of COPS/Metro Alliance, examined the business of private prisons, which are being used in Texas and other states to detain thousands of immigrants. The private prison companies are funded by ICE, and ultimately taxpayers foot the bill. Watch Montiel’s presentation here. While Bond was a legendary figure beginning in the 1960s, some millennials may have no idea who he is. And with help from his oldest child, Phyllis Bond-McMillan, we augmented the story with dozens of links to poetry, video and essays about Julian Bond's work. What if you could protect the planet and save money without leaving your front yard? Come October, San Antonio’s "Pay as you Throw" program rolls out and will let you add a free green cart to send organic waste back to nature: that's grass clippings, tree trimmings, leaves and other compostable goodies. And, you can cut your trash bill if you go further by putting more in the blue recycling cart and sending less to the landfill in a smaller, brown garbage cart.